Computational Psychiatry aims to describe the relationship between the brain's neurobiology, its environment and mental symptoms in computational terms. In so doing, it may improve psychiatric classification and the diagnosis and treatment of mental illness. It can unite many levels of description in a mechanistic and rigorous fashion, while avoiding biological reductionism and artificial categorisation. We describe how computational models of cognition can infer the current state of the environment and weigh up future actions, and how these models provide new perspectives on two example disorders, depression and schizophrenia. Reinforcement learning describes how the brain can choose and value courses of actions according to their long-term future value. Some depressive symptoms may result from aberrant valuations, which could arise from prior beliefs about the loss of agency (‘helplessness’), or from an inability to inhibit the mental exploration of aversive events. Predictive coding explains how the brain might perform Bayesian inference about the state of its environment by combining sensory data with prior beliefs, each weighted according to their certainty (or precision). 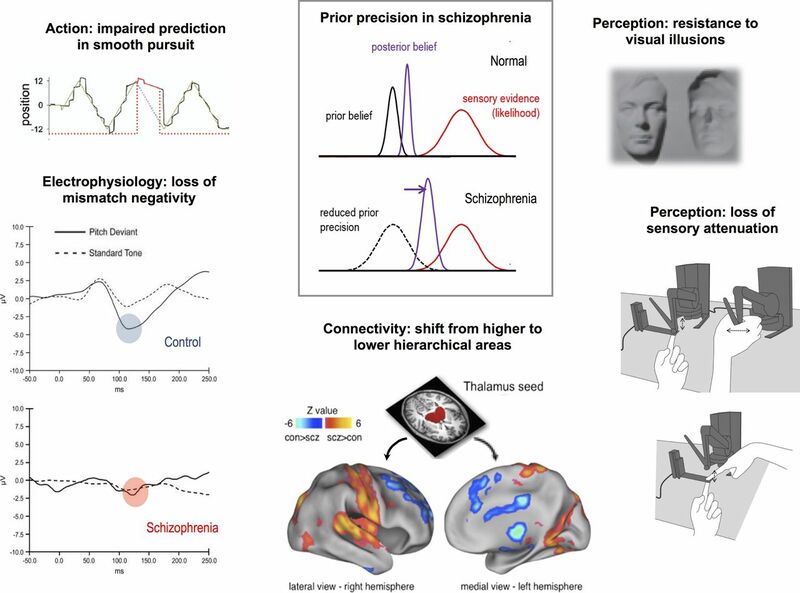 Several cortical abnormalities in schizophrenia might reduce precision at higher levels of the inferential hierarchy, biasing inference towards sensory data and away from prior beliefs. We discuss whether striatal hyperdopaminergia might have an adaptive function in this context, and also how reinforcement learning and incentive salience models may shed light on the disorder. Finally, we review some of Computational Psychiatry's applications to neurological disorders, such as Parkinson's disease, and some pitfalls to avoid when applying its methods. Computational Psychiatry aims first to model the computations that the brain performs—that is, the brain's solutions to the problems it faces—and second to thereby understand how the ‘abnormal’ perceptions, thoughts and behaviours that are currently used to define psychiatric disorders relate to normal function and neural processes. By formalising mathematically the relationship between symptoms, environments and neurobiology, it hopes to provide tools to identify the causes of particular symptoms in individual patients. Computational Psychiatry is at least partially motivated by the shortcomings of the current psychiatric classification systems (the Diagnostic and Statistical Manual of Mental Disorders, or DSM-5,1 and the International Classification of Diseases, or ICD-102), in which the symptoms entail the diagnosis and which lack mechanistic explanations for mental symptoms. The reliability of diagnostic systems was ‘bought at the price of validity’3—meaning clinicians have some confidence that given a set of symptoms they would all make a consistent diagnosis, but no confidence that that diagnosis corresponds to a single biological or psychological entity, or that it can predict the outcome of either the illness or a given treatment. Likewise, the biopsychosocial model of mental illness4 has had great success in helping clinicians understand illness at a human level, but as a causal account it fails: its constituent parts (particularly the biological and psychosocial) are separated by a wide explanatory gap. The National Institute of Mental Health (NIMH) generated the Research Domain Criteria (RDoC5) in an attempt to revive psychiatric classification with a bracing dose of mechanistic validity. The RDoC consists of five ‘domains’ of mental functions that are each described at multiple levels or ‘units of analysis’: the hope is that these units will yield biomarkers to distinguish normal and abnormal functioning. In principle, this approach has several advantages, but we note that the current RDoC (it is a working document) views psychiatric disorder—including its social risk factors—through a very biological lens. Indeed, its units of analysis step from ‘genes’ to ‘molecules’ to ‘cells’ to ‘circuits’ to ‘physiology’, and then leap straight to ‘behaviour’. Computational Psychiatry provides some of the tools to link these levels. Numerous authoritative reviews of initial developments in Computational Psychiatry already exist,6–15 alongside pioneering work by Hoffman,16 Cohen17 and many others. In this article, we look towards the future and—using examples from depression and schizophrenia—illustrate Computational Psychiatry's potential for reconceptualising psychiatric disorders and generating new hypotheses. Prior to this, we briefly rehearse the advantages in adopting a Computational Psychiatry approach. Computational Psychiatry's organising principles arose in computational neuroscience, when Marr18 identified three levels at which the problems solved by the brain may be described. At a ‘computational’ level, the formal nature of the problem has to be described: What are the mathematical and statistical issues involved? What solutions do these issues allow? The ‘algorithmic’ level describes the method of solving the problem. This may be an approximation or a much more complex procedure. The ‘implementational’ level describes the physical realisation of this method: How does coordinated activity in neurons or brain circuits encode these algorithms? Critically, these three levels are not entirely independent. Although any algorithm could be implemented physiologically in many ways, constraints at one level have implications at other levels: Some computations (eg, high-dimensional integrals) may be very laborious for neural systems, so algorithmic approximations become necessary. System failures caused by complex computational problems can therefore provide important clues about underlying algorithms. In the biological sphere, this simple trinity is crossed with other relevant levels of description. For example, the implementational level itself can be decomposed into RDoC's various ‘units of analysis’, from genes to physiology as well as (we would argue) social interaction.8 ,19 With respect to most mental disorders, Computational Psychiatry lies at the nexus of these descriptive levels and makes them explicit. Computational Psychiatry is mechanistic in a way that the DSM-5, ICD-10 and biopsychosocial model can never be, thanks to its use of generative models. A generative model is a probabilistic description of how high-level causes actually generate low-level data (in contrast, a discriminative model merely describes how to label such data with their likely causesi). This distinction is important because knowing how causes generate data allows a model to generate synthetic or ‘simulated’ data from given causes. A hierarchical generative model, illustrated using the ‘beads’ or ‘urn’ task. On the left, two jars are hidden behind a screen, one containing mostly green and some red balls, the other the converse. A sequence of balls is being drawn from one of these jars, in view of an observer, who is asked to guess from which jar they are coming. We have illustrated a simple hierarchical generative model of this process on the right: the observer is using such a model to make his/her guess. Variables in shaded circles are observed, and variables in unshaded circles are ‘hidden’ (ie, part of the model only). At the bottom of the model is x1, the colour of the currently observed bead. Uncertainty about this quantity (eg, if the light is low or if the participant is colour-blind) is denoted as ω1. At the next level of the model is x2, the belief about the identity of the current jar, and its associated uncertainty ω2, known as state uncertainty or ambiguity. Another form of uncertainty, risk or outcome uncertainty (ω0) governs the relationship between the identity of the jar and the next outcome: Even if we are sure of the jar's identity, we cannot be certain of the colour of the next bead. At the top of the model is the belief about the probability that the jars could be swapped at any time, known as volatility. We have not shown them here but this could have its own associated uncertainty, and there could be further levels above this. Last, the participant must use his/her belief about the identity of the jar to make a guess: The mapping between this belief and the response y is affected by a degree of stochasticity or decision ‘noise’, τ. 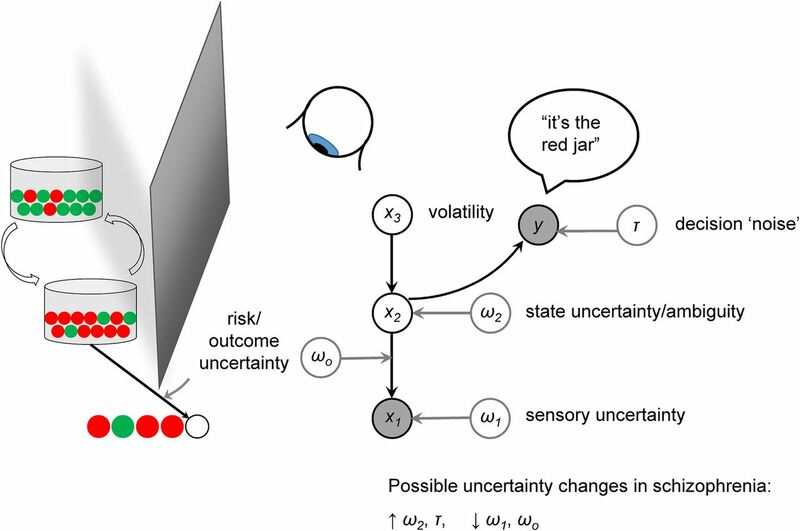 In schizophrenia, there may be too much uncertainty (ie, lower precision) in higher hierarchical areas that encode states or make decisions, and an underestimation of uncertainty in lower (sensory) areas. Formulating a generative model requires an explicit description of the mathematical details of the cognitive or neural process from the outset. This is difficult but important, as it can force one not only to think hard about what particular constructs (such as ‘attention’ or ‘salience’) really mean,22 but also to be very explicit about assumptions and ignorance. It is true that the new science of epigenetics (heralded by Engel4 almost 40 years ago) also places genes firmly in their environmental context; but as an explanation of mental illness, a gene–environment interaction in the absence of any computational specification is a sandwich without the meat. What Psychiatry ultimately wants to know is: How and why does this gene–environment interaction change inference (and thereby experience and behaviour)? One important, but unfulfilled, aspiration of the architects of DSM-5 was to move beyond purely categorical diagnoses to a more dimensional system, as it seems our current categories are not valid at the clinical24 or genetic25 levels. Such an approach would not classify a person with psychosis as just one of ‘schizophrenic’, ‘bipolar’ or ‘schizoaffective’, but might instead score them on scales of ‘manic’ and ‘depressive’ mood symptoms, ‘positive’ (delusional and hallucinatory) and ‘negative’ (avolitional) psychotic symptoms, and ‘cognitive impairment’. Computational Psychiatry can accommodate and inform both categorical and dimensional approaches—each driven by data. For example, one might find that depressed participants and controls differ continuously (dimensionally) on a certain parameter derived from a certain computational model (eg, ‘reward prediction error signalling’).26 Alternatively, one might find evidence that different models are used by distinct groups (ie, possible categories) to perform the same task, for example, patients with schizophrenia with high or low negative symptoms,27 or those with remitted psychosis and controls.28 More generally, having defined alternative (eg, categorical vs dimensional) models, Computational Psychiatry allows one to assess the evidence for competing theories formally, for instance using Bayesian model comparison. Identifying computational categories and dimensions in this way ought to improve both psychiatric nosology29 and the targeting and monitoring of treatments. Computational theories of mind often mirror contemporaneous engineering practices, and vice versa. In the 1970s, for example, philosophers of mind took inspiration from the computer's manipulation of symbols according to deterministic syntactic rules, and sought to explain how humans might also think logically.30 Recently, computer science has tried to make machines that can learn and make probabilistic inferences using uncertain or incomplete data, as biological agents can. In this section, we briefly introduce some necessary theoretical constructs in probabilistic inference and action selection before discussing some Computational Psychiatry approaches to depression and psychosis. Put as simply as possible, the brain's fundamental computational task is to infer the state of its environment and choose actions on that basis. Unfortunately, neither its sensory data nor its prior knowledge is completely reliable, and so the brain must use both sources of information—taking into account their uncertainty—to perform its task. The optimal combination of uncertain information is given by Bayes’ theorem, in which a ‘prior’ (the initial expectation of the state of the environment) is combined with a ‘likelihood’ (the probability of the sensory input, given that expectation) to compute a ‘posterior’ (an updated estimation of the state of the environment). For simplicity, these probability distributions are often assumed to be of a kind that can be represented by a few ‘sufficient statistics’; for instance, the mean and precision (inverse variance) of a Normal distribution, in this case both prior and likelihood, can be conveniently weighted by their (scalar) precision. Hierarchical generative models can use predictive coding (or other methods) to predict low-level data by exploiting their high-level descriptions, for example, reconstructing the missing part of an image.34 ,35 In predictive coding, a unit at a given hierarchical level sends messages to one or more units at lower levels which predict their activity; discrepancies between these predictions and the actual input are then passed back up the hierarchy in the form of prediction errors. These prediction errors revise the higher level predictions, and this hierarchical message passing continues in an iterative fashion. Exactly which predictions ought to be changed in order to explain away a given prediction error is a crucial question for hierarchical models. An approximately Bayesian solution to this problem is to make the biggest updates to the level whose uncertainty is greatest relative to the incoming data at the level below: that is, if you are very uncertain about your beliefs, but your source is very reliable, you ought to change your beliefs a lot. A classic psychology experiment illustrates uncertainty at different levels (see figure 1). Imagine you are shown two jars of beads, one containing 85% green and 15% red beads, the other 85% red and 15% green. The jars are then hidden and a sequence of beads is drawn (with replacement)—GGRGG. You are asked to guess the colour of the next bead. Even if you are quite certain of the identity of the jar (say, green), you will still be only 85% certain that the next bead will be green. This is ‘outcome uncertainty’ or risk. Imagine you see more beads—the total sequence is GGRGGRR. Now you are very uncertain about the identity of the jar. This is ‘state uncertainty’ or ambiguity. Imagine you see a much longer sequence—GGRGGRRRRRGGGRGGGGGGRGGGG. From this, it seems that the jar changes from green (5 draws), to red (5 draws), to green (remaining sequence). Such temporal changes in hidden causes give rise to ‘volatility’;36 ,37 for example, someone surreptitiously switching the jar during the experiment. Now suppose that although the real proportions are 85% and 15%, a malicious experimenter misleadingly told you that they are 99.9% and 0.1%. From the 25 draw sequence above, you might reasonably conclude that the jars had actually changed eight times—whenever the colour changed. This is what happens when the precision at the bottom of a hierarchical model is too high relative to the precision at the top: Following a sensory prediction error, the model concludes that there must have been a change in the environment (in this simplistic example, the jar), rather than ‘putting it down to chance’. This precision imbalance might contribute to the well-known ‘jumping to conclusions’ reasoning bias in schizophrenia38 (although another cause might be noisy decision-making28) and the formation of delusional beliefs themselves, which commonly arise in an atmosphere of vivid sensory experiences and strange coincidences.14 We return to the subject of delusions in the Psychosis section. On top of the inference about current stimuli and states, the brain needs to solve a second, orthogonal and complicating problem, which arises from the fact that behaviours have both immediate and future consequences. A brief moment of pleasure can have nasty consequences and, though tempting, might best be avoided. Conversely, pain now might result in even greater pleasures later. Optimal behaviour needs to weigh the future against the present. Even in the rare circumstances where inference about the present is perfectly realisable, the brain therefore faces a second set of uncertainties. As the future is not known, the values of possible actions (their summed future rewards and punishments) have to be somehow estimated. The field of reinforcement learning (RL) has delineated two fundamentally different ways in which past experience is used to estimate and predict future rewards and punishments: so-called model-based (MB) and model-free (MF) cognition. In MB or goal-directed cognition, experience is compiled into a (possibly hierarchical) generative model of the world—a mechanistic, causal understanding of the causes and consequences of actions and events. When faced with a particular situation, this model can be searched, and the quality of various behaviours deduced—even if they have never been tried or experienced. As this involves somehow simulating or inferring future possibilities, it can have high computational costs. In MF or habitual cognition, conversely, the agent does not store information about state transitions (ie, exactly what is likely to happen next if a particular action is performed); instead, the agent merely records how much reinforcement is obtained when a certain state st is visited at time t or an action at is taken. The agent then computes the discrepancy between the expected outcome Vt(st) and the actually obtained outcome rt—the prediction error δt=rt+Vt(st+1)−V(st). MF learning adds a fraction ε of the reward prediction errors δt to the expectations every time the state st is visited: Vt+1(st)=Vt(st)+εδt and thereby reduces the discrepancy between expected and received reinforcements. Under some conditions, this will reveal the true, consistent set of values that incorporate ‘future’ outcomes to the extent that these have followed past choices. We next describe these issues in the context of depression and schizophrenia, with the discussion of depression focusing more on valuation, that is, weighing the future, and that of schizophrenia on inference in the present. Depression is by its nature an aversive state, usually accompanied by negative thoughts about the self, the world and the future, and sometimes characterised by reduced interest and/or pleasure known as anhedonia. However, the core symptoms of depression—sadness, a lack of energy and a reduced ability to enjoy things—are also a frequent but temporary feature of everyday affective experience. The symptoms can become a condition of potentially life-threatening severity if they become part of a vicious circle of negative affect, cognition and behaviour that is impervious to positive influences. With respect to the potential causes of depression, the most obvious candidate in RL is the so-called utility or reward function r. This function uses one scalar number to describe how rewarding (increasingly positive) or punishing (increasingly negative) events in the world are. Some kinds of events may have genetically encoded reward or punishment utilities—most likely, only those of direct relevance to the individual's genetic fitness. Other events acquire ‘utility’ through experience and inference. A very broad undervaluation as in anhedonia could arise from reductions in hard-wired primary utility functions. However, evidence for this is both scant and complex. The apparent utilities of two likely primary events—pleasure derived from sweet tastes and pain—are not reliably blunted in depression when measured in the laboratory.42 ,43 This contrasts with richer and more complex stimuli such as pictures of facial expressions, movies and music, where blunted affective ratings and physiological responses are reliably present in the appetitive and aversive domains.44 Since the affective value of these more complex stimuli has to be constructed and inferred, unlike that of events with primary utility, this points to the impaired inference about value as the central driver of undervaluation in depression. RL is concerned with the problem of assigning and inferring value. Specifically, it provides a set of techniques to infer the long-term primary utility, either when occupying any one particular state or when faced with a particular stimulus devoid of any intrinsic primary utility itself, such as a picture. Either of the two classes of approaches to valuation, MB and MF, could in principle underlie aberrant valuation of complex stimuli. One feature that is of particular interest is emotion regulation. We suggest that it again arises chiefly in MB evaluation and might be understood in terms of meta-reasoning. Since most valuation problems are computationally demanding, the MB evaluator faces the meta-reasoning problem of how to allocate its resources efficiently—that is, how to choose which evaluative (internal) actions maximise the chances of choosing the best (external) action. For example, one could sacrifice an exhaustive search of all possible outcomes to save time by only evaluating a small number of more likely scenarios. This problem has many of the features of the original valuation problem, but differs in that in theory it only incurs computational costs and not those of the real world (eg, pain). In practice, however, this distinction does not seem to hold for humans. Since imagination of aversive events has emotionally aversive consequences, internal simulations themselves also incur some of the same costs as real-world experience. Indeed, it has been found that MB valuation is exquisitely sensitive to simulated events. Healthy subjects robustly avoid plans that involve losses.63 It appears that patients with depression have a deficit in this inhibition of aversive processing,64 ,65 with aversive stimuli hijacking rather than inhibiting processing:66 This is a potential cause of the repetitive negative thoughts typical of rumination67—a key component of the depressive vicious circle. Having discussed aspects of valuation in depression, we now turn to a discussion of inference in schizophrenia. Specifically, we explore how various neurobiological abnormalities in schizophrenia might be characterised in computational terms, and how these characterisations might aid our understanding of the disorder. We discuss reductions in synaptic gain in higher hierarchical areas, and increased presynaptic dopaminergic availability and its consequences for tonic and phasic dopaminergic signalling in the striatum. What are the main cortical abnormalities in schizophrenia and what do they have in common (reviewed in detail elsewhere68)? One key abnormality is thought to be hypofunction of the N-methyl-d-aspartate receptor (NMDA-R)—a glutamate receptor with profound effects on synaptic gain (due to its prolonged opening time) and synaptic plasticity (via long-term potentiation or depression)—in both the prefrontal cortex (PFC) and hippocampus (HC). A second is the reduced synthesis of γ-aminobutyric acid (GABA) by inhibitory interneurons in PFC. A third is the hypoactivation of D1 receptors in PFC (we shall discuss striatal hyperactivation of D2 receptors in the next section). How can synaptic gain (and its loss) be understood in computational terms? One answer rests on the idea that the brain approximates and simplifies Bayesian inference by using probability distributions that can be encoded by a few ‘sufficient statistics’, for example, the mean and its precision (or inverse variance). While precision determines the influence one piece of information has over another in Bayesian inference, synaptic gain determines the influence one neural population has over another in neural message passing. The neurobiological substrate of precision could therefore be synaptic gain,22 and a loss of synaptic gain in a given area could reduce the precision of information encoded there. Effects of a hierarchical precision imbalance in schizophrenia. A loss of precision encoding in higher hierarchical areas would bias inference away from prior beliefs and towards sensory evidence (the likelihood), illustrated schematically in the middle panel. This single change could manifest in many ways (moving anticlockwise from left to right). (i) A loss of the ability to smoothly pursue a target moving predictably (in this plot, the patient with schizophrenia constantly falls behind the target in his eye tracking, and has to saccade to catch up again); when the target is briefly stabilised on his retina (to reveal the purely predictive element of pursuit), shown as the red unbroken line, his/her eye velocity drops very significantly (figure adapted from Hong et al76). (ii) These graphs illustrate averaged electrophysiological responses in a mismatch negativity paradigm, in which a series of identical tones is followed by a deviant (oddball) tone; in the control subject, the oddball causes a pronounced negative deflection at around 120 ms (blue circle), but in a patient with schizophrenia, there is no such deflection (red circle); that is, the brain responses to predictable and unpredictable stimuli are very similar (figure adapted from Turetsky et al71). (iii) The physiological change underlying the precision imbalance is a relative decrease in synaptic gain in high hierarchical areas, and a relative increase in lower hierarchical areas. This change would also manifest as an alteration in connectivity, shown here as significant whole brain differences in connectivity with a thalamic seed between controls and patients with schizophrenia; red/yellow areas are more strongly coupled in those with schizophrenia, and include primary sensory areas (auditory, visual, motor and somatosensory); blue areas are more weakly coupled, and include higher hierarchical areas (medial and lateral prefrontal cortex, cingulate cortex and hippocampus) and the striatum (figure adapted from Anticevic et al72). (iv) An imbalance in hierarchical precision may lead to a failure to attenuate the sensory consequences of one's own actions,75 here illustrated by the force-matching paradigm used to measure this effect. In this paradigm, the participant must match a target force by either pressing on a bar with their finger (below) or using a mechanical transducer (top): Control subjects tend to exert more force than necessary in the former condition, but patient with schizophrenia do not (figure adapted from Pareés et al119). (v) A loss of the precision of prior beliefs can cause a resistance to visual illusions that rely on those prior beliefs for their perceptual effects. Control subjects perceive the face on the right as a convex face lit from below, due to a powerful prior belief that faces are convex, whereas patients with schizophrenia tend to perceive it veridically as a concave (hollow) face lit from above. An alternative interpretation of these changes is that pathology in the PFC or HC (eg, in postsynaptic signalling and neurotrophic pathways77) might impair the formation and representation of prior beliefs more generally, rather than directly and selectively affecting only a separate representation of their certainty. Indeed, if this were the case, then reducing the influence of aberrant beliefs on sensory processing might even be computationally adaptive (and physiological rather than pathophysiological), since it would reduce their (possibly misleading) influence on inference. How do the above ideas relate to the actual symptoms of psychosis? A reasonable hypothesis would be that a loss of high-level precision in the brain's hierarchical inference might result in diffuse, generalised cognitive problems (as are routinely found in schizophrenia78) and overattention to sensory stimuli (as is found in the ‘delusional mood’; similar in some respects to the loss of central coherence in autism—see below). In addition, it could lead to the formation of more specific unusual beliefs, as the reduced high-level precision permits updates to beliefs that are larger and less constrained. This is because the precision of (low-level) prediction errors is much higher, relative to the (high-level) prior beliefs (an imbalance reflected in connectivity analyses72). However, one might expect that these unusual beliefs should be fleeting—as they themselves would be vulnerable to rapid updating—unlike delusions. The positive symptoms of schizophrenia are strongly associated with the elevated presynaptic availability of dopamine in the dorsal (associative) striatum,79 and are reduced by D2 receptor (but not D1 receptor) antagonists (although neither is always the case80). Increased stimulation of striatal D2 receptors might then be a sufficient cause of psychosis, but the exact nature of this stimulation and how it causes psychotic symptoms remains unclear. In electrophysiological studies, dopamine neurons show both tonic and phasic firing patterns;81 D1 receptors are most sensitive to phasic bursts, whereas tonic activity and phasic pauses are best detected by D2 receptors.82 These patterns cannot be distinguished using brain imaging in humans, unless their computational roles can be modelled and thus their quantities inferred from behaviour. It is as yet unclear how the increased presynaptic availability of dopamine alters these patterns in schizophrenia: One might expect that both tonic and phasic release would increase in proportion, but an increase in tonic release could reduce phasic release, for example, via inhibitory presynaptic receptors,83 and these two modes of release have also been argued to be at least partially independent.81 We now explore how these patterns may be disrupted in schizophrenia, and how this might affect computations. Tonic striatal D2 hyperstimulation is thought to increase inhibition of the corticostriatothalamocortical loops in the so-called indirect pathway through the striatum. The indirect pathway itself contains two inhibitory pathways. One (via the subthalamic nucleus) causes blanket inhibition of action and acts as a brake, but the other is channelised84 such that it can help switching to alternative actions. If the indirect pathway enables switching, then increased tonic D2 receptor activity in the striatum ought to oppose this (interestingly, D2 receptors also suppress alternative task ‘rules’ in PFC85). Indeed, reversal learning performance decreases with increasing occupancy of D2 receptors in the dorsal86 ,87 and ventral81 striatum, and with genetic variants in the dopamine transporter that might increase tonic dopamine.88 Sufferers of schizophrenia are impaired at reversal learning over and above their generalised cognitive impairment,89 ,90 which is in keeping with these findings. D2-mediated inflexibility might even make delusions so resistant to change. From a computational point of view, this striatal D2 hyperstimulation could reduce an agent's perception of volatility in the world (x3 in figure 1), causing action tendencies (known as policies) to become more fixed and have (incorrectly) high ‘precision’. Indeed, work in addiction has similarly argued that dopamine promotes rather less flexible habits over goal-directed choices.91 This is interesting because it is conceivable that a hyperdopaminergic increase in (dorsal striatal) precision of policies might occur as an adaptation to a loss of (prefrontal) high-level precision (ω2 in figure 1),68 that is, that the excessive dorsal striatal dopamine release found in prefrontal dysfunction92 ,93 is an attempt to stabilise thoughts and action selection in the face of cognitive instability. Even if this is so, one must still ask why so many other risk factors for schizophrenia—for example, social isolation or subordination, prenatal or perinatal adversity, and acute stress—cause dopamine hyperactivity?79 One could argue that the computational commonality among these factors is an increase in predicted environmental volatility, but raised tonic dopamine release makes decisions less, not more, volatile. Aside from aberrant salience, there are many other potential explanations for negative symptoms;15 for example, pronounced asymmetry in learning (ie, a failure to learn stimulus-reward associations but intact learning of stimulus-punishment associations), a failure to infer the values of actions (cf. anhedonia in depression), greater discounting of rewards that require effort,110 and a loss of uncertainty-driven exploration such that valuable states are never discovered. In this brief overview, we have attempted to highlight some aspects of the Computational Psychiatry approach to characterising and measuring the brain's inferences. We have not had space to review Computational Psychiatry approaches to many mental disorders, such as anxiety,111 personality disorder,8 autism,112 attention deficit hyperactivity disorder,113 addiction,6 functional symptoms114 and others. We focused instead on two examples: The first was that of depression, where we suggested that MB valuation may be the at the root of anhedonia.27 Our second example was the concept of reduced high-level precision in schizophrenia. We must emphasise, however, that their description in the context of specific disorders should not necessarily be taken to imply specificity to these disorders. The dysfunctions in meta-reasoning described here in depression could probably be applied equally well to certain anxiety disorders.115 Anhedonia is also found in schizophrenia, and in this context just as in depression, hedonic responses to primary rewards seem normal,116 yet pleasure-seeking behaviour is reduced. If so, Computational Psychiatry might help identify transdiagnostic computational mechanisms: we must then investigate the extent to which such mechanisms share biological substrates. Similarly, alterations in the use or representation of uncertainty may underlie phenomena not just in schizophrenia, but also in autism (eg, a resistance to visual illusions, and sensory overattention112). However, an important difference between the disorders may be that this reduction in precision arises earlier in development in autism. Thus, while sufferers of both disorders may have uncertainty about the mental states of others, those with autism have never learnt to attribute mental states to others. In contrast, those with schizophrenia have done so in the past, but in the present they find themselves in a state of high anxiety and uncertain of others’ intentions, possibly suggesting why paranoid persecutory ideas might be commonly found in schizophrenia, but not autism. In this case, then, common computational mechanisms may undergo distinct interactions with the environment. In both cases, the hope is that Computational Psychiatry will identify patterns that map more closely onto the underlying neurobiology than current diagnoses do. This asymmetry could underlie the phenomenon of pathological gambling in the context of dopamine agonist treatment: such patients may be able to learn only from their wins but not their losses. Interestingly, the opposite asymmetry (better learning from positive feedback, reversed by antidopaminergic medication) was seen in the hyperdopaminergic Tourette's syndrome.117 Computational Psychiatry approaches are also being used to investigate motivation and effort cost in apathy118—found in Parkinson's disease and numerous other neurological conditions—and it will be interesting to see how many underlying computational mechanisms are shared with negative symptoms in schizophrenia. Computational Psychiatry is no panacea, however, and several important pitfalls ought to be mentioned. The first is the interpretation of the results of Bayesian model selection: the ‘best’ model is extremely unlikely to model the true generative process correctly, and may be but the best of a set of bad models. Model comparison must always be accompanied by model validation, which involves generating surrogate data from the model and comparing it qualitatively with the data of interest. Generating data will in fact often identify systematic failures of models that may confound the interpretation of their parameters. This will require the addition of ad hoc parameters to explain specific aspects of the data that may interfere with inference, but not be of interest. Consider a data set where a patient has an idiosyncratic preference for responding to the left or to the right. If such a preference is not allowed for in the model, then the parameters of the model will be forced to explain such a preference. This may lead to spurious conclusions, just as the failure to recognise such irrelevant idiosyncrasies may confound classical analyses. Furthermore, modelling does not replace careful experimental design. If a task does not exploit a particular computation, then that computation cannot be examined simply by fitting a model requiring that computation to the data. Put differently, the complexity of the model must be supported by complex data, and this in turn requires appropriate experimental design. The last pitfall we shall mention concerns a ubiquitous parameter in decision-making models: the ‘temperature’ parameter of the softmax action selection function. This controls the stochasticity of decision-making, such that the greater it is, the less decisions reflect the values of different options, that is, the more random they are. It is always possible, however, that a difference in the stochasticity of responses between groups reflects a non-random process that has not been included in the model. Hence, it is important to examine whether the noise assumed by the model actually matches that observed in the data. Our fundamental message is that thinking of the brain as having to solve inferential problems can be a fruitful way of generating testable computational hypotheses about psychiatric disorders. The Bayesian perspective formalises the key aspects of inference and underlines the importance of uncertainty, while the RL view formalises the key aspects of choice. Characterising psychiatric disorders as problems of inference or learning—whether in the domain of rewards, threats, somatic percepts, ‘external’ percepts or social inferences—makes them tractable to analysis with these techniques. The authors would like to thank Professor Peter Dayan, Professor Karl Friston and our reviewers for their valuable comments on the manuscript. American Psychiatric Association. DSM 5. American Psychiatric Association, 2013. World Health Organization. ICD-10: International classification of mental and behavioural disorders: clinical descriptions and diagnostic guidelines. Geneva: WHO, 1992.
. Computational psychiatry. In: Jaeger D, Jung R, eds. Encyclopedia of computational neuroscience. Heidelberg: Springer Verlag, 2013. http://www.springer.com/biomed/neuroscience/book/978-1-4614-6674-1 (accessed 8 Sep 2014).
. A computational investigation into the human representation and processing of visual information. WH San Francisco: Freeman and Company. Published Online First: 1982. http://www.contrib.andrew.cmu.edu/~kk3n/80-300/marr2.pdf (accessed 24 Feb 2014).
. Time to abandon the bio-bio-bio model of psychosis: exploring the epigenetic and psychological mechanisms by which adverse life events lead to psychotic symptoms. Epidemiol Psichiatr Soc 2009;18:299–310.
. The language of thought. Harvard University Press, 1975.
. Divide and conquer: hierarchical reinforcement learning and task decomposition in humans. In: Baldassarre G, Mirolli M, eds. Computational and robotic models of the hierarchical organization of behavior. Springer Berlin Heidelberg, 2013:271–91.
. Depression: clinical, experimental, and theoretical aspects. University of Pennsylvania Press, 1967. http://books.google.co.uk/books?hl=en&lr=&id=6rigtdo0u2UC&oi=fnd&pg=PA3&dq=Depression:+clinical,+experimental+and+theoretical+aspects.+Beck+1967&ots=T24fJ6IZ4J&sig=thZDfH7W5RLsXQthY_WD_oLjKj8 (accessed 13 Jan 2015).
. Schema therapy: a practitioner's guide. Guilford Press, 2003. http://books.google.co.uk/books?hl=en&lr=&id=vScjGGgJEZgC&oi=fnd&pg=PA1&ots=hSWWcyJj_I&sig=a5AuhdJMCZYpL0AHeTeL17_jnwI (accessed 13 Jan 2015).
. Chapter 3—the role of learning-related dopamine signals in addiction vulnerability. In: Diana M, Di Chiara G, Spano P, eds. Progress in brain research. Elsevier, 2014:31–77. http://www.sciencedirect.com/science/article/pii/B9780444634252000039 (accessed 28 Jan 2015). Funding RAA is supported by the National Institute of Health Research. QJMH is supported by a Swiss National Science Foundation grant (320030L_153449/1). JPR is supported by the Wellcome Trust (101798/Z/13/Z). ↵i In mathematical terms, discriminative models learn p(causes|data)—the probability of some causes, given the data—whereas generative models learn the reverse, p(data|causes), and use that (and p(causes) and Bayes’ theorem) to compute p(causes|data).